Black Ice Software - BiLPD Manager version 2.05 is released! BiLPD Manager version 2.05 is released! 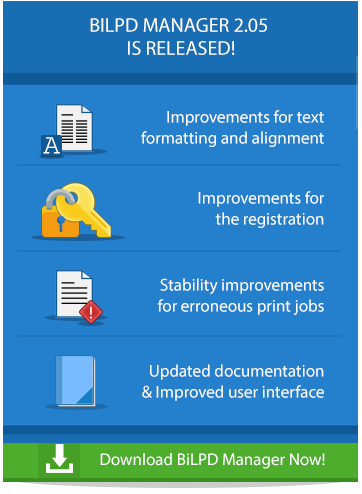 Major improvements for the text formatting, alignment, stability improvements for handling erroneous print jobs and improvements for the registration! Black Ice Software has released BiLPDManager version 2.05. This version includes major improvements for the text formatting and alignment for text mode prints and also includes stability improvements for handling erroneous print jobs - incorrect or blank filename. The BiLPD Manager version 2.05 includes improved registration for using the products with multiple users on the same computer. Version 2.05 of the BiLPD Manager also includes minor user interface improvements and updated documentation to enhance user's experience. Download the Latest BiLPD Manager!